Now that it’s most of the way through the first month of the new year, I have to ask – How is everybody doing with those resolutions? Did you resolve to eat more healthy? There are so many ways that one can interpret “healthy” eating, and whether you believe in making resolutions or not, one way that we can all improve our health is by eating fewer processed foods and committing to a more plant based diet. If one of your promises to yourself was to incorporate more fruits and vegetables into your diet, maybe new kitchen tools will be just the inspiration you need to keep that resolution even longer. I love my collection of kitchen gadgets, though I don’t know about you, but I find that I am enamored with many of them initially and then lose interest because they are just more trouble than they are worth. Like a good handbag that gets used over and over again, my favorite kitchen tools are the ones I am attracted to initially because they are cute but then realize just how well they fit my needs. 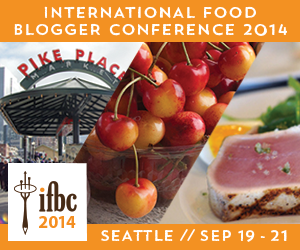 Last fall I attended IFBC (the International Food Blogger Conference) held here in Seattle. During the vendor fair (imagine a whole banquet room full of food and cooking vendors! ), I was drawn to a table full of kitchen tools that caught my eye with their brightly colored and ergonomic handles. Oh my! I found myself drooling over them! These would look great in my kitchen! But would they be just as useful as they were adorable? The company was so nice to offer to send me a few samples to try out in my own kitchen and I have to say I have been very impressed with these babies! 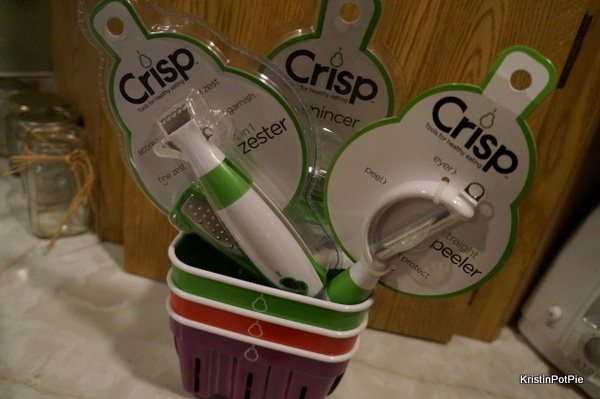 Crisp creates “tools for healthy living.” Developed by award winning housewares designers, they make healthy cooking more fun and playful and fit in your hand just like they were made to be there. These uniquely designed tools that help you solve your everyday food prep problems are also dishwasher safe and affordable. Herb Mincer: For more healthy cooking, fresh herbs can be used to add flavor in place of unwanted fat or salt. But who likes chopping them? Knives can leave herbs uneven and bruised, as well as a big mess on your fingers, knife and chopping board. This mincer is the best! The sleek and comfortable shape fits in the palm of your hand and keeps your fingers safely away from the five stainless steel blades that chop and mince in no time! It comes apart for ease in cleaning. And if you have ever been challenged with getting the leaves off the stems you will love the two sizes of leaf strippers at the end of the mincer. 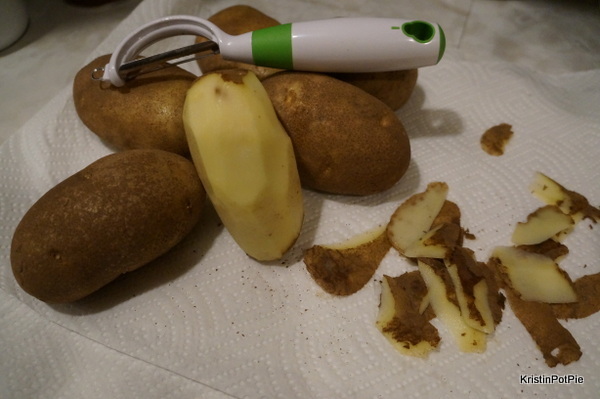 Straight Peeler: I have tried so many peelers over the years but this one actually works! The versatile handle is designed so that you can hold it in a variety of positions and the angled head makes peeling so much more effortless. Removing skin from your fruits and vegetables is fast and easy with the high quality stainless steel blade and the built-in eyer is handy for getting rid of bruises and blemishes. 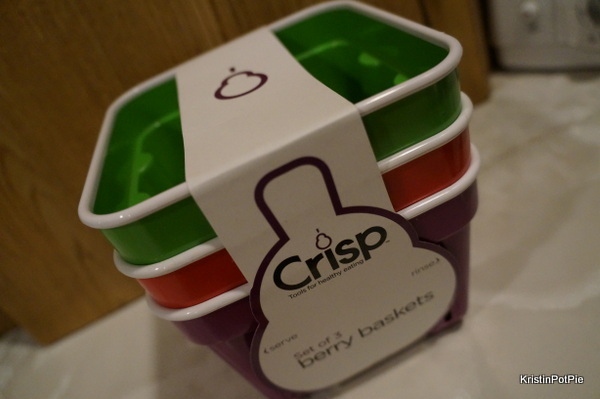 Berry Baskets (3 pack): We eat a lot of berries around here. My teenage son, who does not really like many fruits and veggies, at least enjoys berries and grapes. So during berry season I buy a lot! Sturdy and stack-able, these attractive containers are great for rinsing, serving and then storing fruit in the refrigerator. The open design allows the berries to breath so that they stay fresher longer. 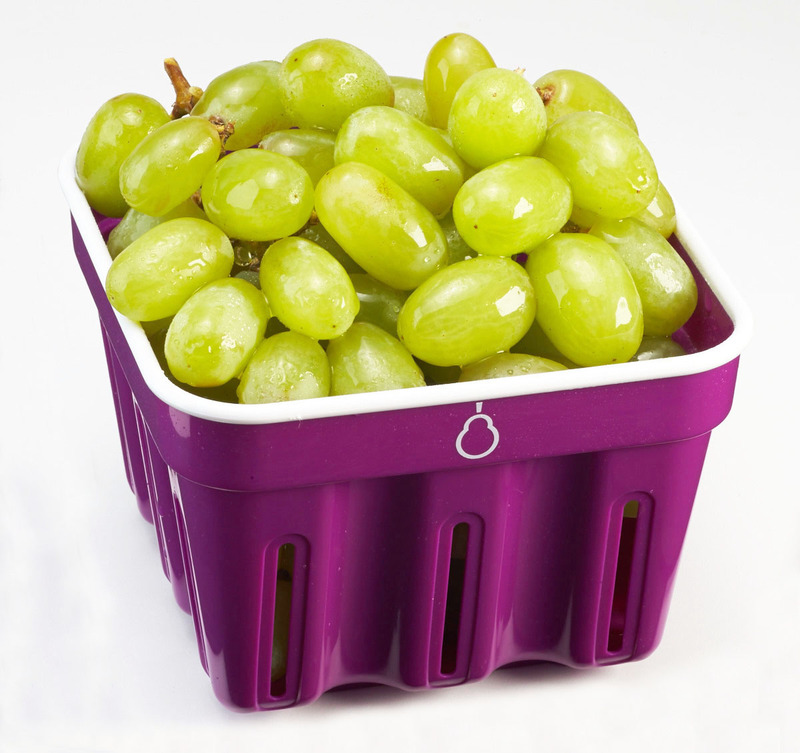 The three-pack of baskets includes one in each bold color – red, purple and green. 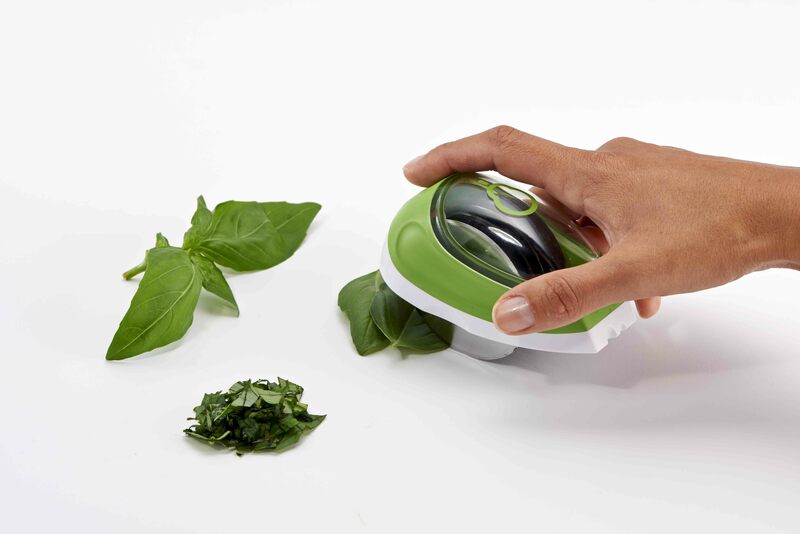 Zester: This multi-use tool will help to make any dish more exciting! It includes a scoring blade and channel knife and two zesting blades – a traditional size, and for big jobs a larger one that folds right into the handle for safe and easy storage. Premium stainless steel blades make for efficient cutting and the ergonomic handle provides comfort while getting the job done. 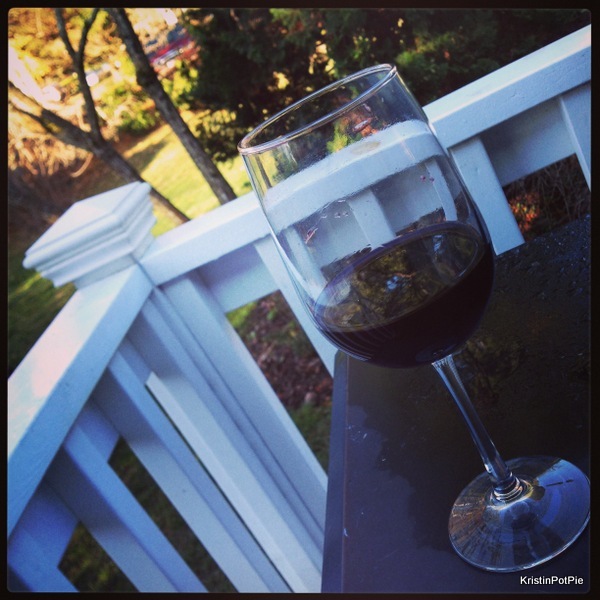 Toasting to Fall with a TRIbella Giveaway! The weather here in Seattle this fall has been just gorgeous. Aside from the sun setting earlier, sunny days and temperatures in the 70’s tricked my brain into thinking that it was still summer. Then the rain came and I snapped out of it. Though I am still having a hard time wrapping my head around the fact that Halloween is next week (followed closely on its heels by Thanksgiving and the holidays! 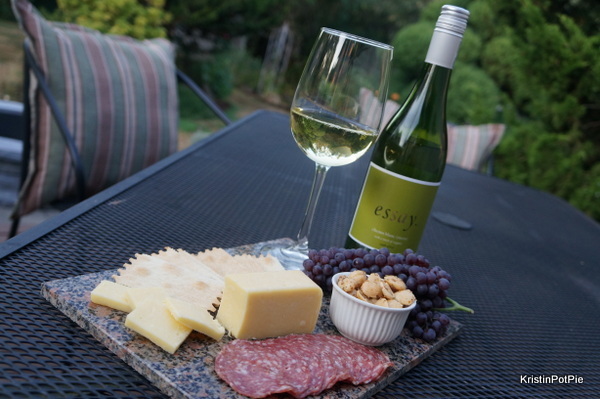 ), for me the loss of summer has led to a preoccupation with one thing – holiday entertaining will soon be upon us! And with that, red wine drinking season will also be in full swing – As the colder weather settles in many shed their Roses and Chardonnays for the warmth and more full-bodied flavor of various red options. 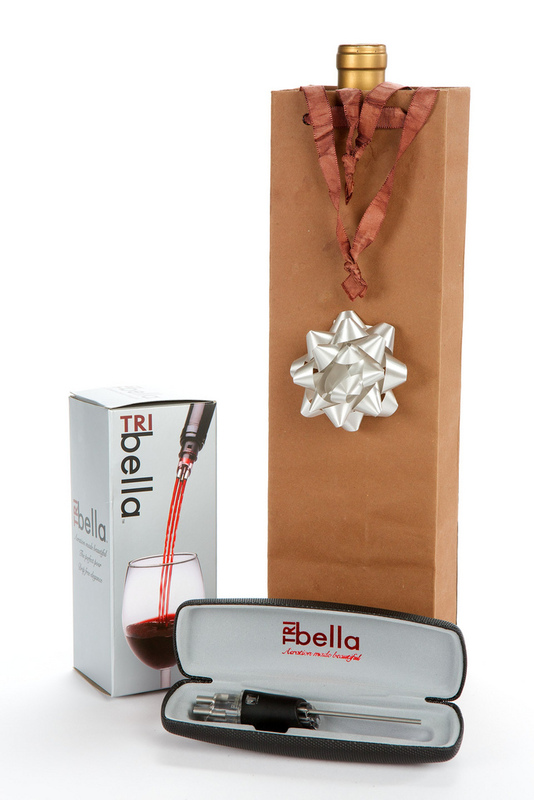 Whether you are entertaining this holiday season and want to delight your guests with the perfect pour, or you are attending a soiree and need an elegant gift for the wine lover in your life, the TRIbella™ wine aerator will put the festive in your festivities. Presented with a bottle of red, this would make for a much appreciated hostess gift. Alone, it is a terrific stocking stuffer. 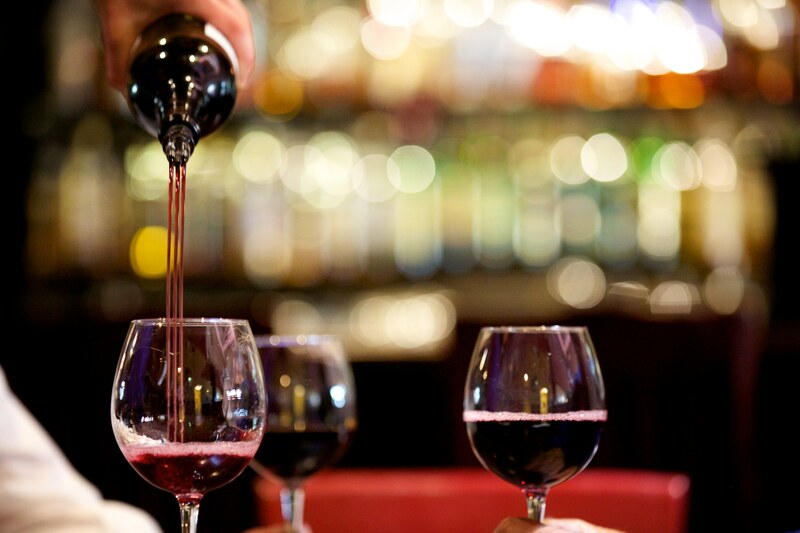 TRIbella™ is wine aeration made beautiful. This patented, trademarked, and innovative aerator, launched in 2014 and designed and engineered in Portland, Oregon is a simple, yet fine-tuned device, created for everyday use. The TRIbella™ allows wine to be poured in three elegant and drip-free streams and to naturally breathe while it falls gracefully into your glass. TRIbella™ exposes wine to air to open up and enhance the flavor of the wine creating a more pleasant experience with beauty and elegance. TRIbella™ allows wine lovers to enjoy their wine with a blend of art and science and is now available on Amazon and through select wine sellers. It even comes in its own protective carrying case so you can take the perfect pour anywhere. 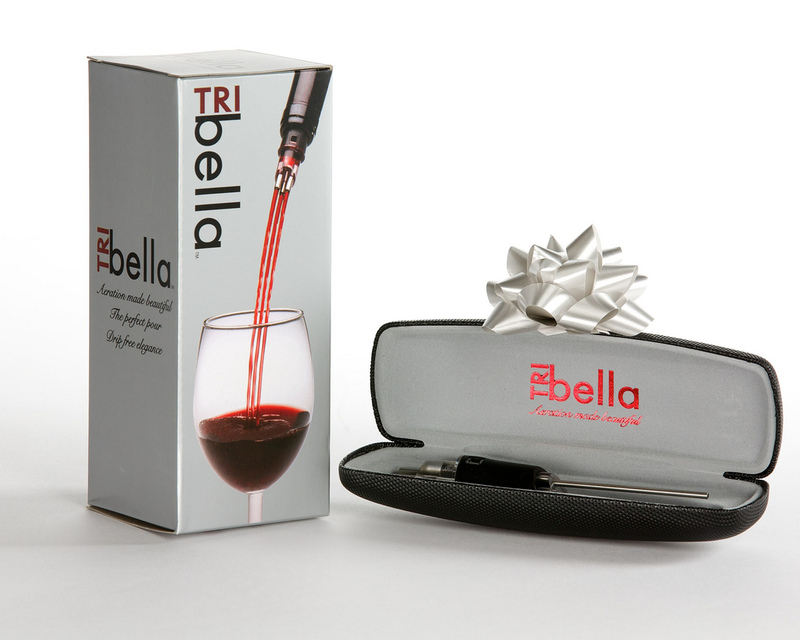 In celebration of the fall season and the upcoming holidays, TRIbella™ is offering a free TRIbella™ Wine Aerator to one of my lucky readers! To enter the giveaway simply leave a comment here on the blog telling me – what are you pouring this Thanksgiving or fall? This giveaway will end Midnight Pacific Time, Thursday, October 30. I will choose one winner from the comments on my blog Friday morning and will email the winner. Winner will have 24 hours to respond before I choose an alternate winner. Photos taken by, and used with permission of, Richard Brown Photography. Happy Birthday Prince George! Say Cheese! Happy 1st birthday Prince George! Did you know that as the world celebrated the birth of Prince George on July 22, 2013 (one year ago today), a cheese was made that day to commemorate the occasion? 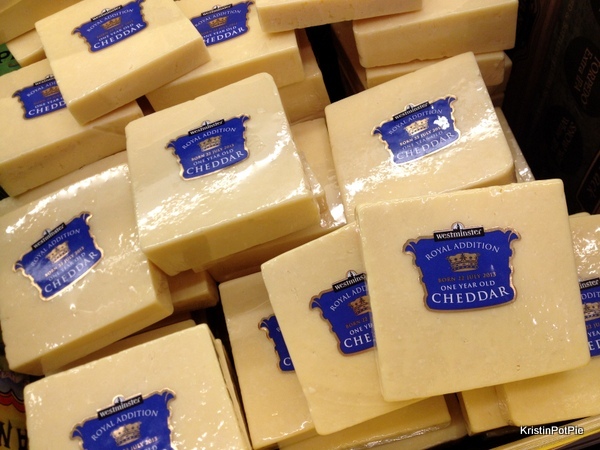 This summer, you can enjoy the one-year-old cheese honoring the young British royal third in line for the throne with the Westminster Royal Addition One-Year-Old Cheddar, available exclusively at Whole Foods Market. Personally, I would rather have a slice of cheese over a slice of cake any day. So, what better way to celebrate a birthday? I stopped by Whole Foods yesterday to pick up some of this very special variety. 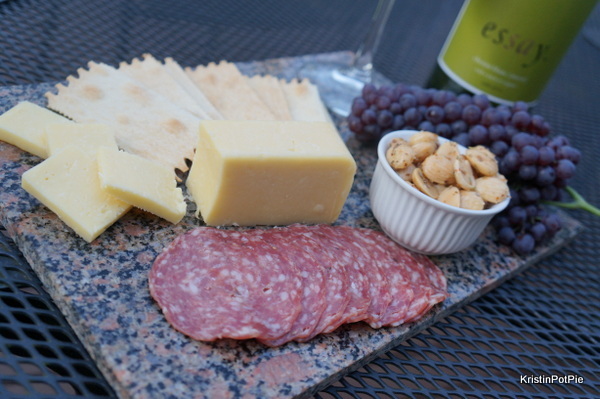 Of course, a few other items were needed to round out my cheese plate. 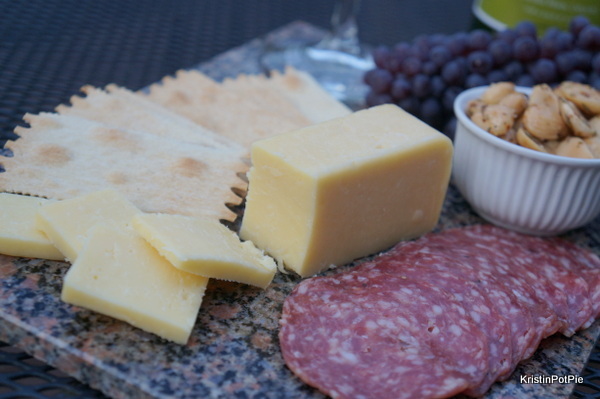 I paired it with salami, marcona almonds, fancy crackers and some tiny champagne grapes. 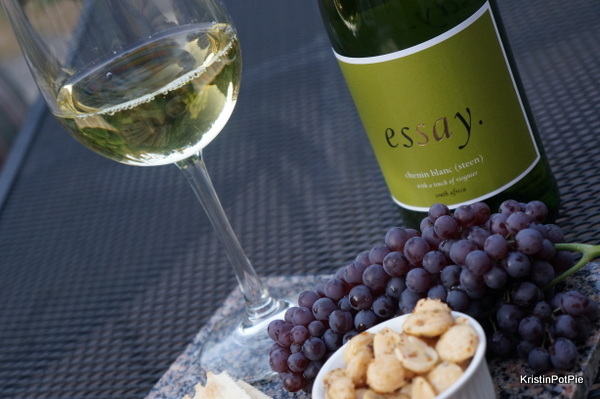 And with cheese, one always needs a nice glass of wine. I asked the Whole Foods sommelier for some help in pairing a wine to my luscious cheese, and he recommended this lovely Chenin Blanc. What a wonderful little summer evening feast, fit for royalty. Simple and delicious! A great way to celebrate any day of the year. 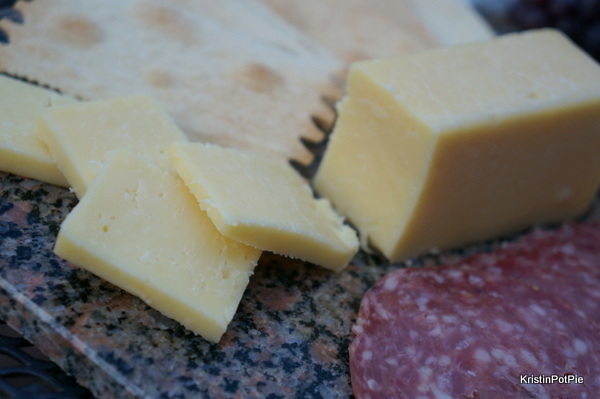 This cheddar has a creamy yet savory flavor. It is made on a farm in Somerset, England by the Barber family – one of the oldest cheddar makers in the world — and is aged for 12 months. The cheese is available through July at $9.99 per pound in all Whole Foods Market locations, but it will only be around for a limited time – so hurry to your closest Whole Foods and stock up! The birds are chirping, the flowers are blooming and with Easter coming this weekend it certainly feels like spring! 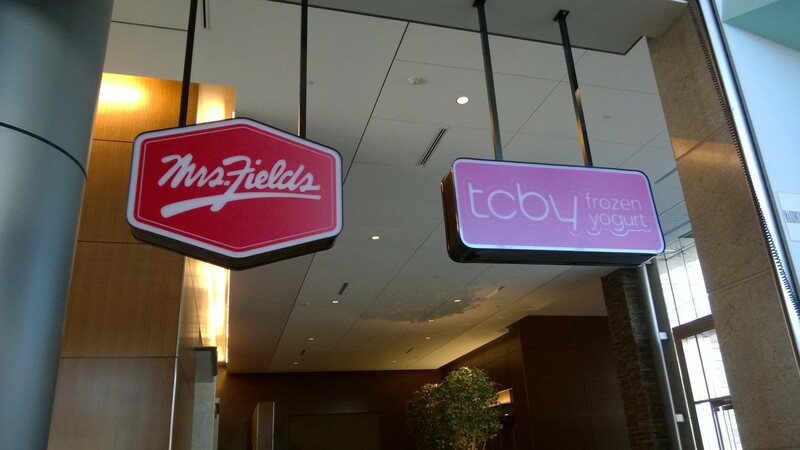 The newly opened TCBY & Mrs. Fields, located in the heart of downtown Bellevue, is celebrating with a Spring Fling Grand Opening on Tuesday, April 29, from 10 a.m. to 6 p.m. in its brand new 1,000 square-foot store in City Center Plaza (555 110th Ave NE, Suite 102). Join me for the festivities! 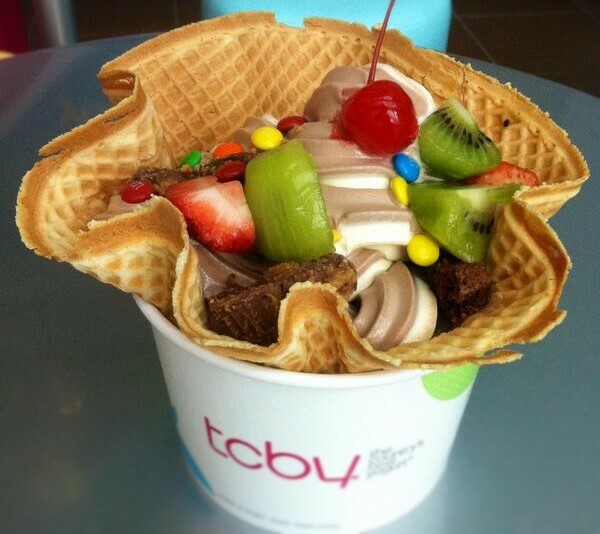 The first 100 customers at the event will receive FREE TCBY Frozen Yogurt with Mrs. Fields Nibbler Cookies and all customers will be treated to 50 percent off any purchase as well as Buy One, Get One FREE coupons toward their next purchase. There will also be plenty of sampling of TCBY Frozen Yogurt and Mrs. Fields Cookies and raffle prizes awarded throughout the day. That’s not all! Guests are also invited to try their hand at a flower-shaped Cookie Decorating Station and have fun at the TCBY & Mrs. Fields photo booth, complete with props to capture and Tweet, post on Instagram and Facebook your ‘sweet’ side. Open Monday through Friday, 7 a.m. to 7 p.m., TCBY & Mrs. Fields serves the greater downtown Bellevue area from morning through evening, with tasty treats from pastries to cookies to frozen yogurt, as well as specialty and custom menu items, perfect for parties, meetings and special occasions. Come to the Grand Opening and see what’s on the menu! To help TCBY & Mrs. Fields of Bellevue celebrate their big day, I am thrilled to be giving away a gift tin of a dozen cookies (Mrs. Fields) and three frozen yogurts (total value approx. $45) to one of my lucky readers today! To enter the giveaway: Simply leave a comment telling me what you love best about spring. This giveaway will end Midnight Pacific Time, Monday, April 28. I will choose one winner from the comments on my blog Tuesday morning and will email the winner. Winner will have 24 hours to respond before I choose an alternate winner. This giveaway is open to local residents only. 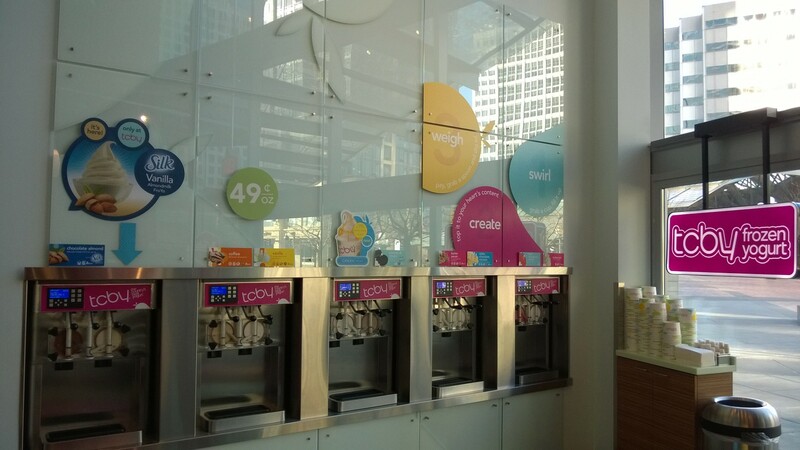 You must be able to pick up your prize at TCBY & Mrs. Fields Bellevue. My newly employed 16 year old son has to work on Easter, so I am hosting the holiday dinner this year. 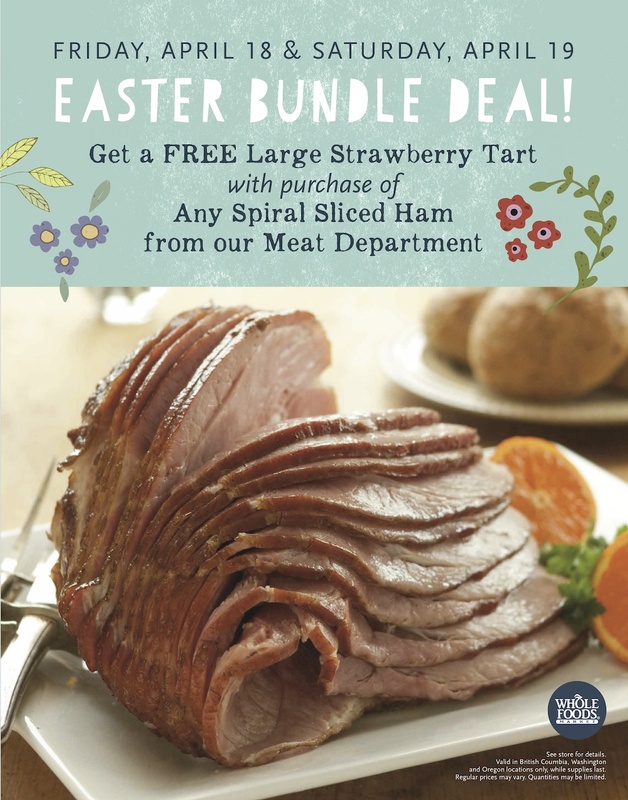 On April 18 and 19th, get a free large strawberry tart when you buy any spiral sliced ham from Whole Foods Market’s meat department. 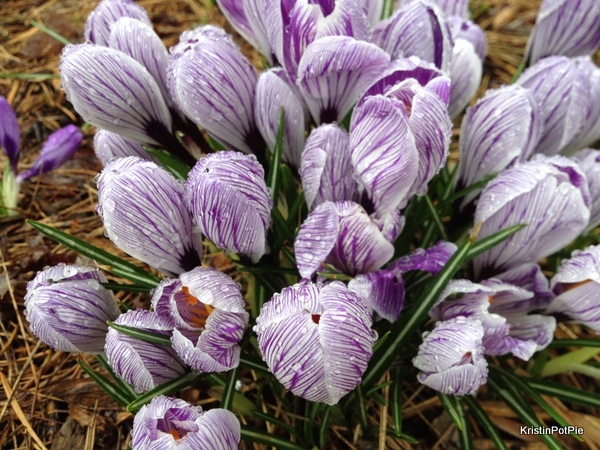 Spring is all about new – fresh buds, sprouting blooms and (finally!) a change in weather. 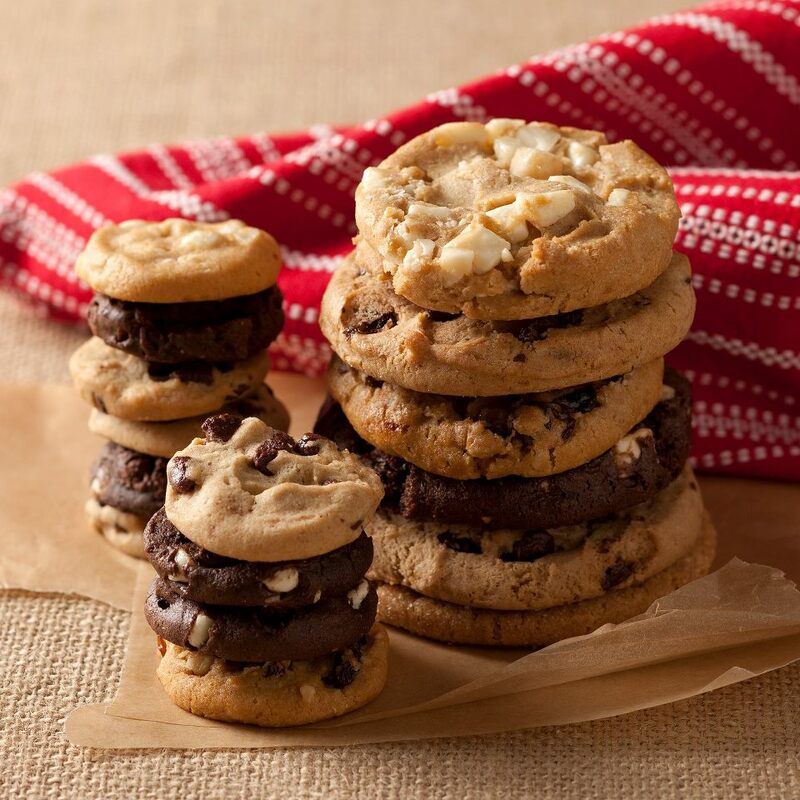 Bring some change to classic holiday recipes for Easter with simple ideas from Whole Foods Market. Drawing on global influences, lighter ingredients, flavor fusion, and the spiral ham deal you can’t miss, these inspired ideas give tradition a twist. Ham and Rhubarb Jam Toasties – Easter ham gets a flavor upgrade with sweet-tart rhubarb jam. Rhubarb is an exciting ingredient only available in spring. Inside-Out Easter Eggs — these deviled eggs put the color inside the egg with the addition of beets to a classically creamy yolk filling. Look for precooked, peeled beets in the produce section. Deviled Frittata – update both a deviled egg and a frittata by combining the familiar flavors into one dish. Rich egg yolks, tart yellow mustard, creamy mayonnaise and sweet paprika flavor this easy frittata. Order online for the most modern upgrade – skip the prep time and focus on family time with a little help from Whole Foods Market’s online ordering. Choose from two complete menus for four, starring either maple-mustard glazed ham, or quiche and smoked salmon. HOLIDAY CROSSOVERS – These crowd-pleasing dishes are great for entertaining during Easter, Passover or any special occasion. Smoked Salmon Crepes with Creamed Peas – these whole wheat crêpes are filled with smoked salmon and topped with a creamy mixture of peas and dill. Matzoh fans can make a rustic version of these crêpes using matzoh meal. Leg of Lamb with Mint Salsa Verde – lamb is a traditional springtime protein, appropriate for both holidays. Mint is a classic flavor combination remixed into this fresh salsa verde. What are you serving for Easter this year? Photos used with permission of Whole Foods Market. In reflecting on our big day, I spent some time re-reading some of the anniversary posts I have shared with you all here on KristinPotPie. In this popular post, honoring our 17th, I shared the 17 things I love about my husband. This one is still my favorite. We were just kids when we met! And I just love those rainbow suspenders! Then, on our 18th anniversary, I wrote about marriage longevity, compromise and our blank walls. That year I made this as an anniversary gift for the hubs. 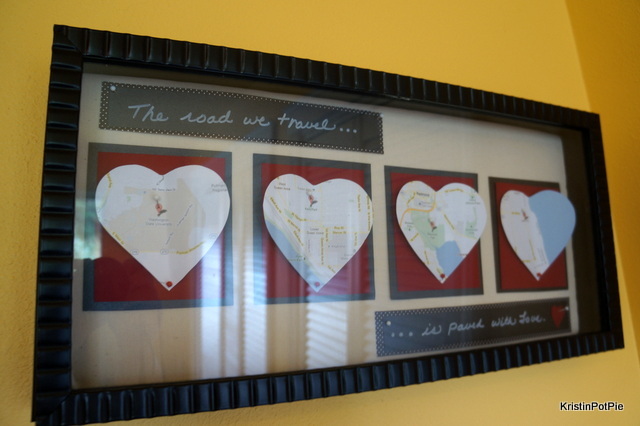 It’s a nice representation of the places that have been pivotal in our relationship – where we met, where we got engaged, where we got married and where we make our home now. Two years later and we do have a few more things on the walls – thanks to my husband’s stepmother who is an amazing photographer and has gifted us with some beautiful prints. Like this one above our half wall. 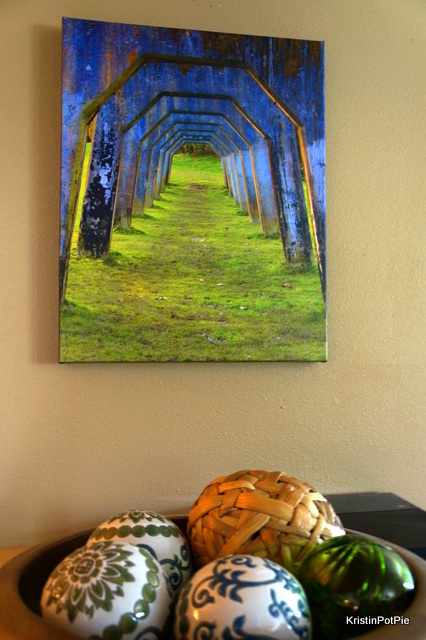 Can you guess where in Seattle this photograph was taken? But compromise can be slow going in this house and our walls are still sorely lacking. Lately we have been cleaning out and organizing our attic – and by “we”, I mean my husband. I know I am crazy – I do not save too many things, but when it comes to my kids – yep, I am so nostalgic. I am definitely a saver when it comes to memories. These boxes were pulled down from the attic and have been sitting in our living room for a while. 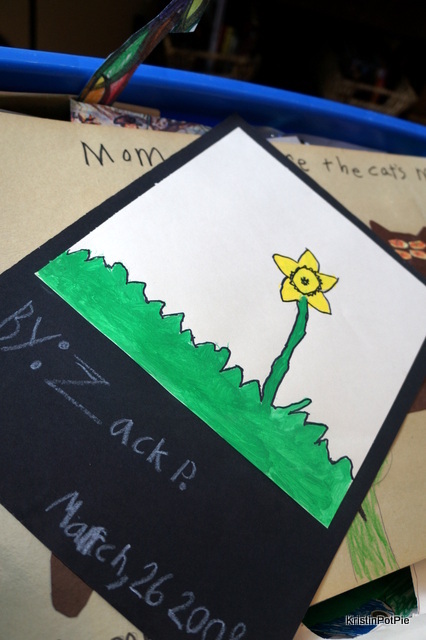 The boys are teenagers now, but their kid art is still too much fun. And I am falling in love with some of these pieces all over again. More kid art on the walls? Why not! This one would be great for spring! Such perfect timing to be introduced to a new mobile app, Mantle Art. It just may come in handy as we work to fill our walls. Mantle Art is the first mobile app developed specifically for custom framing your art – modern framing made easy. And even better? Mantle Art is generously offering YOU – my readers – 20% off to try it out. The Mantle Art app offers a simple and fast way for consumers to select, preview and purchase custom framing for your art, whether you are at home (perfect for kid art!) or perhaps at a gallery, shop, or art fair. With the touch of a button, customers can determine exactly how the art will look and how much it will cost to frame. 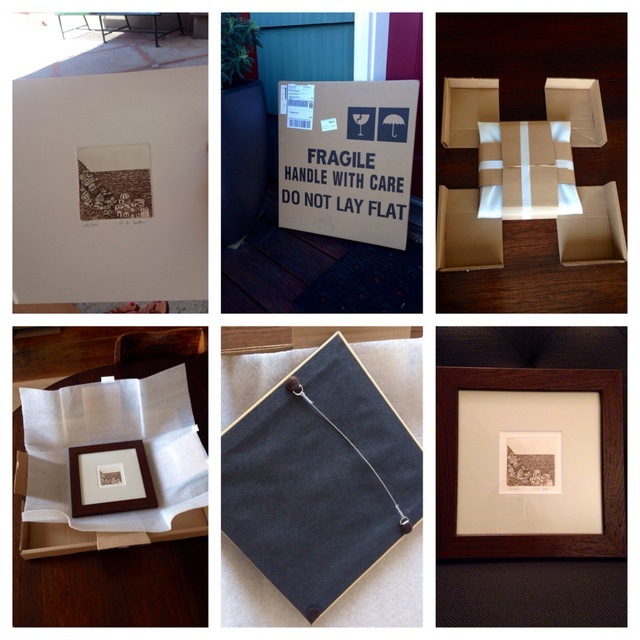 No more waiting around the frame shop or second guessing the expensive cost of framing, as Mantle Art does all of the work within seconds. Simply download the free app, select the size of your image and then snap a photo of it. Within seconds, Mantle Art will make suggestions for what looks best. Pricing will be made available each step of the way. Once a customer has made their framing selection, Mantle Art will send either a tube or envelope to collect the artwork. 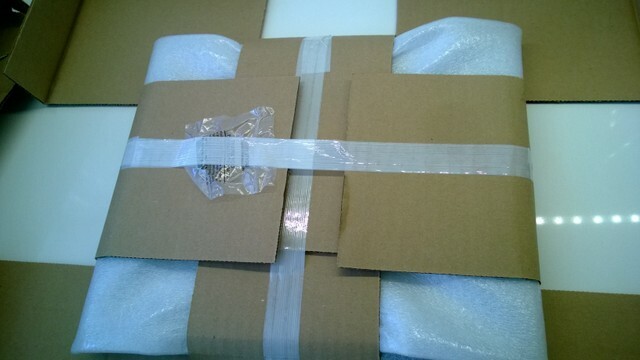 Shipping is included and the art is insured. The entire process takes up to two weeks. 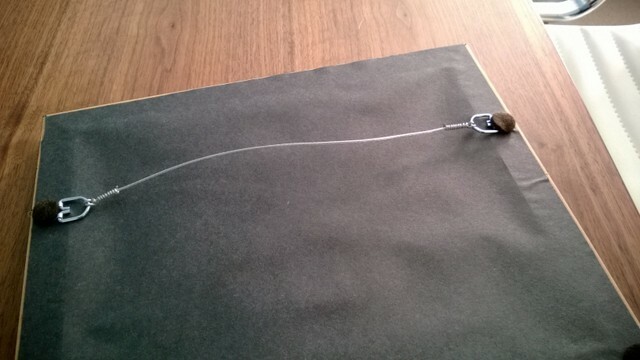 Once the custom framed piece is received, all that is left is to hang it and enjoy. The Mantle Art app is available through the iPhone app store and can also be used on an iPad. Now my husband and I just have to come to an agreement about which wall to fill first! Beast Corn for the Big Game! I know I have been neglectful of the blog lately but I spent much of the month sick with that bad flu that everyone has been getting, plus I have been a bit buried at work with a big fundraising event coming up next week. But, I have been taking time out to watch some football. And I am getting super excited for the big game coming up this weekend! The Seahawks are in the Super Bowl and I can’t wait to see them crush Denver! Who’s with me? Of course the best thing next to the game (and the commercials!) is the snacks! 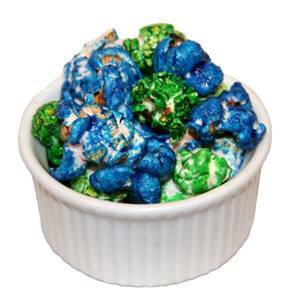 Seattle is so excited that our home team is going to the BIG GAME so to help us say it as loud as possible KuKuRuZa Gourmet Popcorn has created a special flavor just for the big day – Beast Corn popcorn, a colored Kettle Corn! It’s snacking delicious and is available in-store and online until game day, Sunday, February 2. Beast Corn popcorn is available in 1 Gallon Bags for $13 each. The last couple of weeks have been a bit of a whirlwind for me. It is almost Christmas but it feels like it was just Thanksgiving. I guess that short season everyone is talking about really does have an effect! In the midst of all the craziness the last couple of weeks I was so lucky to have received a package from my swap match from PNWSwaps, Khristena of Just One Grain blog. It actually took me several days before I opened it and went through to see what I had received from Khristena. And boy, was I excited to see all the goodies inside! 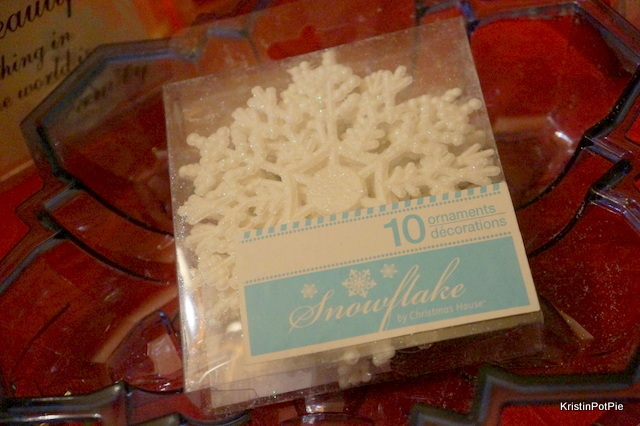 Love these snowflake ornaments – right up my alley. And a snowflake bowl to match! How did she know that serving dishes are a big hit with me! 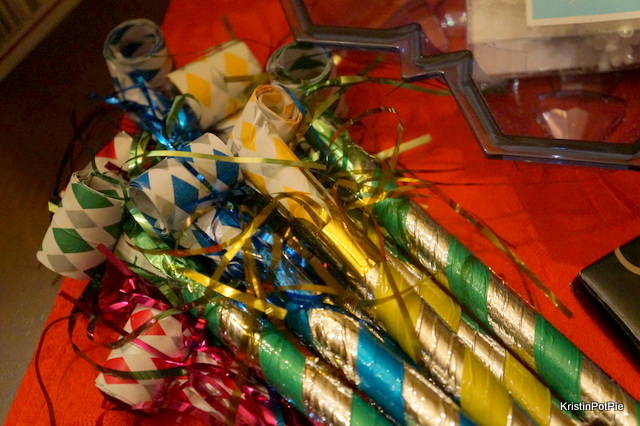 I’m saving these fun, colorful blowers for New Year’s! Thank you so much Khristena! Here’s how the box swap works: all you do is sign up, tell a bit about what kinds of things you like and you are matched up randomly with another local person. You then do a bit of shopping, send your package out by the deadline and wait to receive yours. 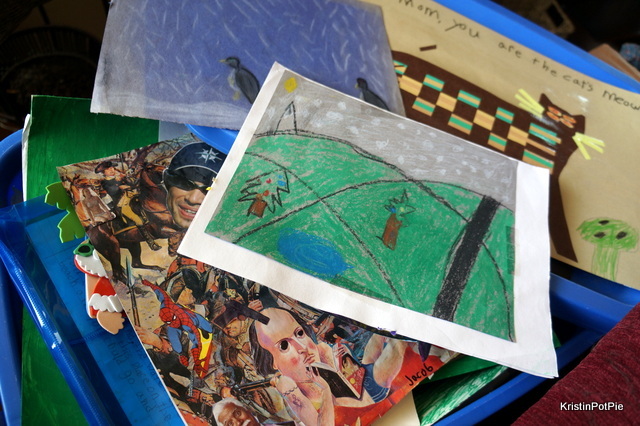 Laura holds frequent box swaps here in the Northwest, so if you would like to join in the fun (anyone can participate – as long as you are local) in the next box swap, go and find out more here. 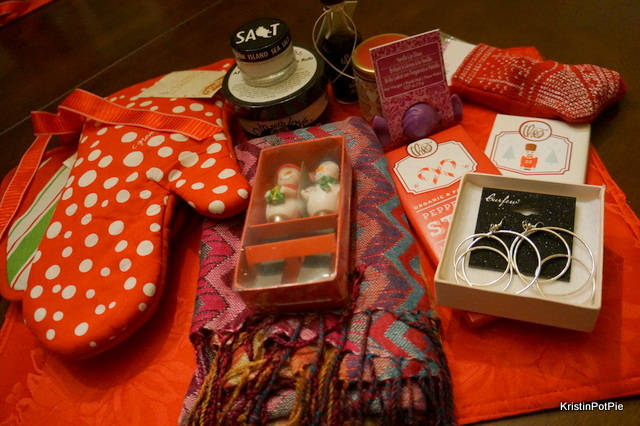 Here is a picture of the contents of the box I sent out to Tiffany of the Thyme of Taste blog – I had SO much fun shopping! It’s really amazing what you can get for $20. Hope you enjoyed your package as much as I enjoyed putting together, Tiffany! Happy Holidays! 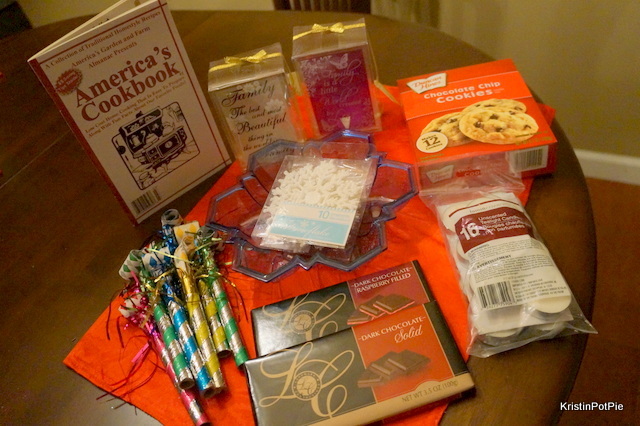 Holiday Gifting With KuKuRuza Popcorn & A Giveaway! UPDATE: This giveaway has ended. Congratulations to the winner, Tana! Hope you enjoy your delicious flight of popcorn! Food makes some of the best gift options for those on your holiday shopping list who are hard to buy for. When I purchase a food gift for someone I like to go local and show off the fantastic selection of artisan purveyors we have here in the Northwest. KuKuRuZa Gourmet Popcorn is owned and operated by a local Seattle family and has been handcrafting gourmet popcorn varieties since 2008. 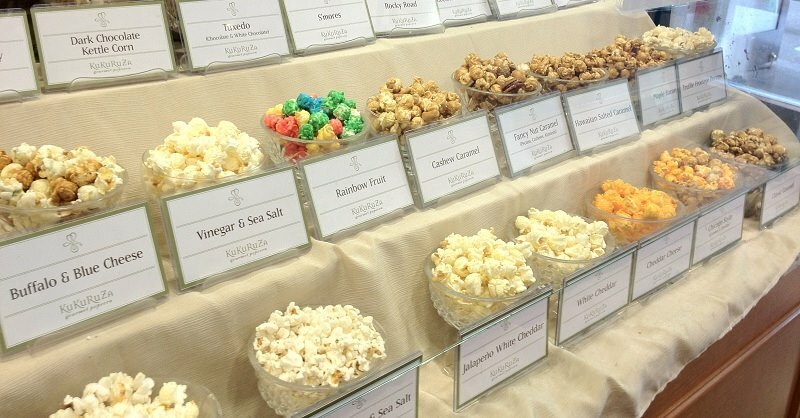 They have a high standard of quality in craftsmanship and service, and strive to provide the best popcorn available, offered in a wide variety of flavors ranging from Hawaiian Salted Caramel and Truffle Fromage Porcini to Coconut Macaroon. At KuKuRuZa, it is their passion to create distinct and unforgettable flavor combinations. In addition to their regular offerings, their artisan popcorn also comes in special seasonal flavors, which this time of year includes Pumpkin Spice Pecan, Peppermint Cocoa and Eggnog Brandy. And for your New Year’s Eve party? KuKuRuZa has the pop for your celebration. 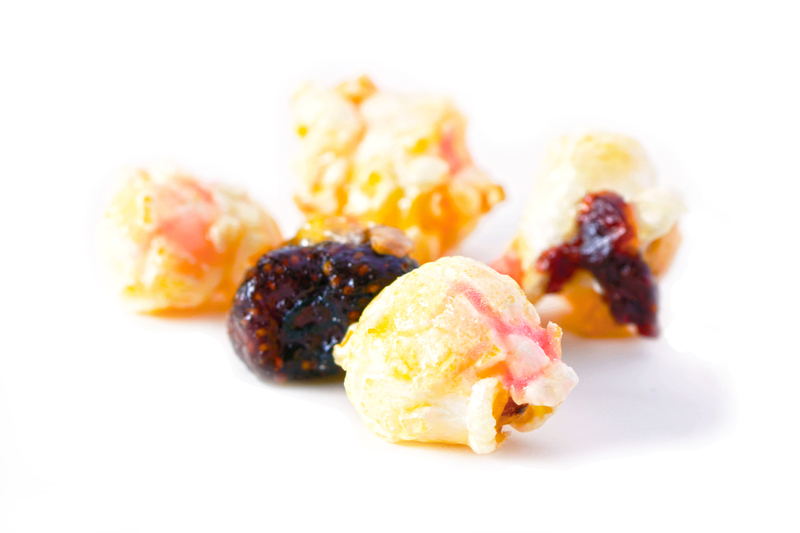 Strawberry Champagne popcorn, available from December 28 through January 31, a lightly sweet strawberry coating on air-popped popcorn, topped with chunks of dried strawberries. It actually fizzes in your mouth! This is a perfect addition to your festivities and a great way to ring in the New Year! KuKuRuZa is making your holiday shopping easier this year with their Holiday Gift Guide featuring stocking stuffer sized bags of popcorn, a mug perfect for teachers gifts and office gift exchanges, variety packs, flight cartons and of course, their gift tins! If you order online now through December 2 and enter the code EARLYSHOPPER13 before checkout, you will receive 15% off your order (excluding shipping). In addition to their four international shops, KuKuRuZa has three distinctive stores in the Seattle area – the Downtown Seattle shop, within sight of the landmark Pike Place Market, where there is always something popping, the Ballard shop, located in the bustling Ballard neighborhood, and the recently opened Bellevue Square location in the heart of Bellevue Square Mall. If you live in the area, stop in to any KuKuRuZa Popcorn shop on Black Friday and Small Business Saturday, and for every $10, customers will receive one free Flight Bag. 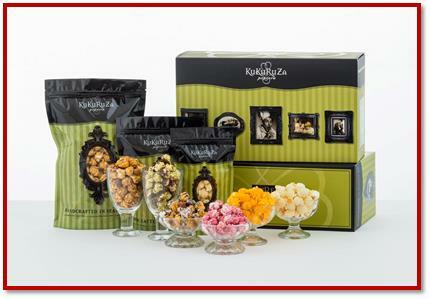 To celebrate the kickoff to the holiday season, the nice people over at KuKuRuZa have offered me one Flight Carton (Seven – 1.5 cup bags of any flavor in stylized box – ready to be gifted!) to give away to one of my lucky readers. 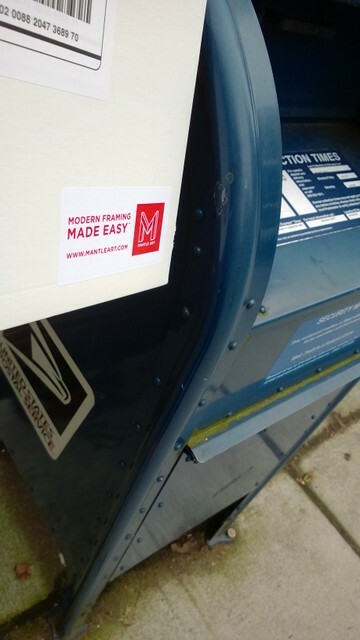 The winner can pick up their gift at one of the stores, or can have it mailed to them. To enter the giveaway: Simply go to the KuKuRuZa website and then come back here to leave a comment telling me which KuKuRuZa flavor you already love or would like to try. This giveaway will end Midnight Pacific Time, Monday, December 2. I will choose one winner from the comments on my blog Tuesday (December 3) morning and will email the winner. Winner will have 24 hours to respond before I choose an alternate winner. While I am really looking forward to Thanksgiving dinner with all the trimmings later this week, all the talk this time of year about large holiday meals of ham and turkey has me dreaming about something very different. 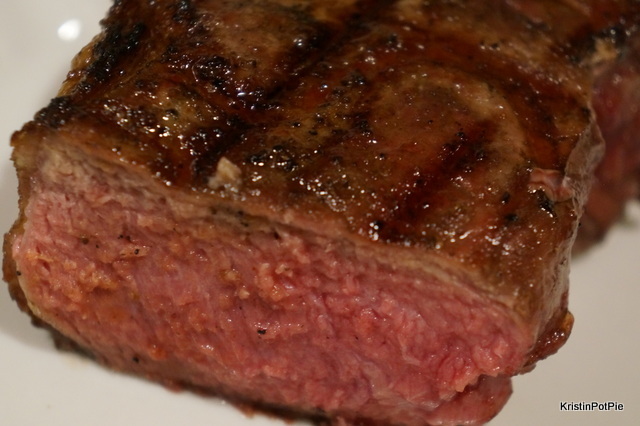 Recently I was contacted by a local food supply company, Marx Foods, and agreed to participate in a review challenge of their Grass-fed Beef New York Strip Steaks. Their Silver Fern brand verified Black Angus beef raised in New Zealand is free range, 100% grass fed (never grain finished) and given no growth hormones. 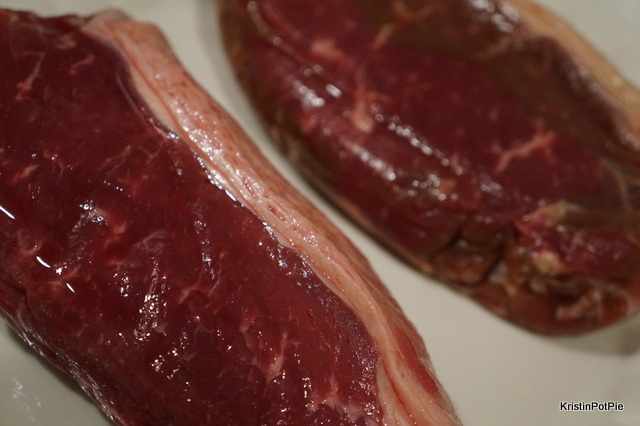 There is a lot information out there about grass fed versus conventional (or grain fed or finished) beef, but the simplest way way to break it down is to look at the topic of marbling. Because most conventional beef is finished off with grains to fatten them up quickly in order to meet a large demand (and are also often treated with hormones or antibiotics to get them to grow bigger faster) they tend to have a higher marbling content than their grass fed counterparts. But how they are fed is not everything – certain breeds of cattle carry their fat differently. Some carry it in layers, which is not as desirable, but Black Angus cattle beef carry their fat throughout their bodies (thus the marbling) and are bred for their high marbling content. Black Angus cattle don’t do well in high temperatures and are best kept in places where the weather is more mild, such as New Zealand. That is why the claim is that this beef is more marbled and flavorful than much of the grass fed beef available in the US. I was so excited to see the Fed-Ex box arrive on my doorstep. And my eyes grew wide as I unwrapped the individually vacuum packaged frozen steaks and saw the deep red color of these two lovelies. 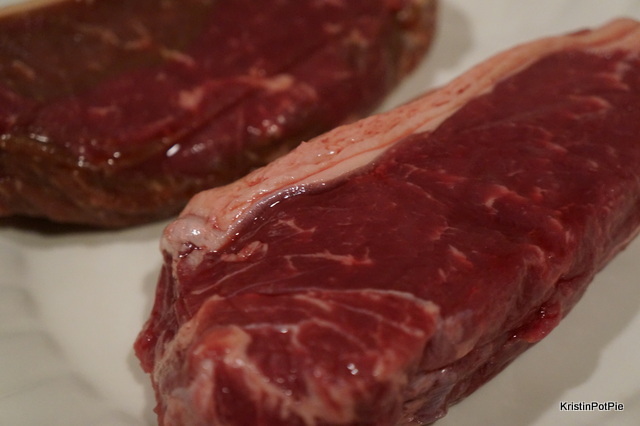 They looked very lean – not as much marbling or fat as I am used to seeing except for that nice strip of fat on the outside of the steak. 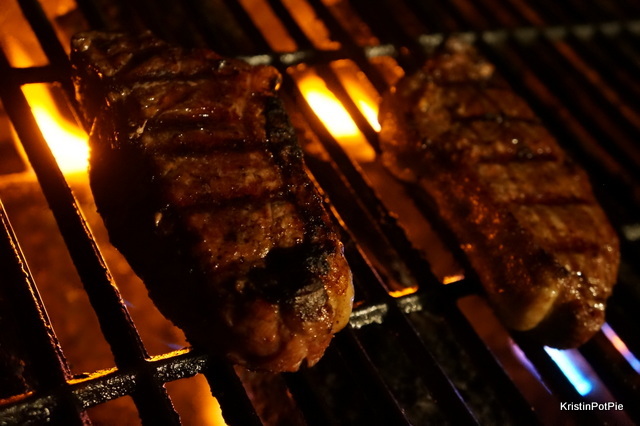 We seasoned them ever so lightly so as to really maximize the natural flavor of the meat and not to interfere with the taste testing process. Hubby cooked them for me on the grill. 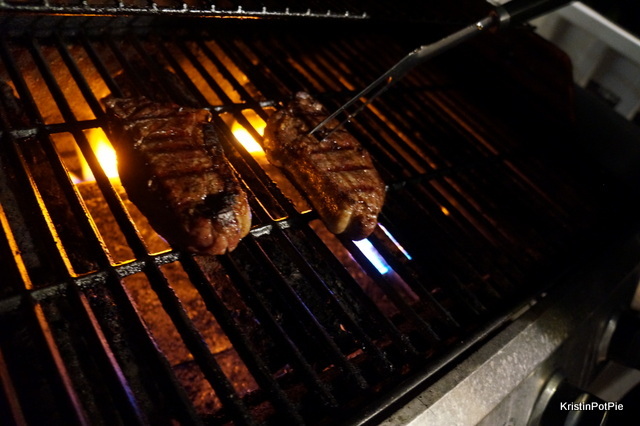 As diehards, we (and when I say “we” I mean “he”) grill year round here unless it is raining hard or below freezing. 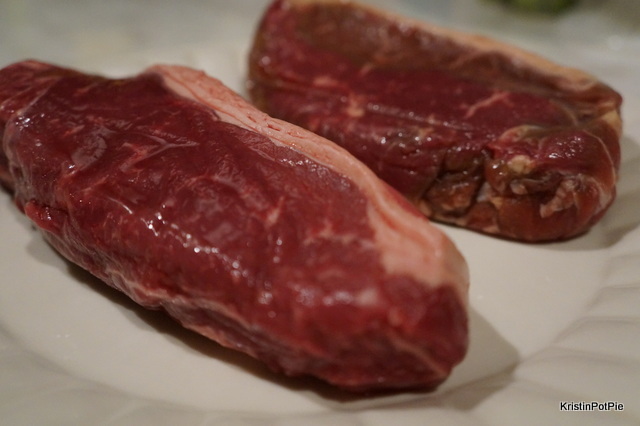 After cooking, you may already know, it is best to let beef set-up for about five minutes before cutting into it. This time though, those five minutes seemed like forever! I could hardly wait to tear into these babies! 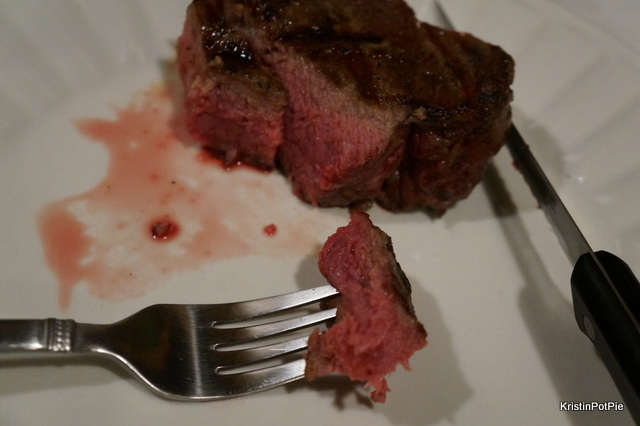 The steaks really were quite delicious and had such an incredible clean, beefy flavor. But what do I mean by clean and beefy? When one eats any type of meat, without really being totally aware of it, you will taste what the animal itself has eaten in its lifetime. Maybe not in a literal sense, but flavor is certainly influenced by what the animal eats. 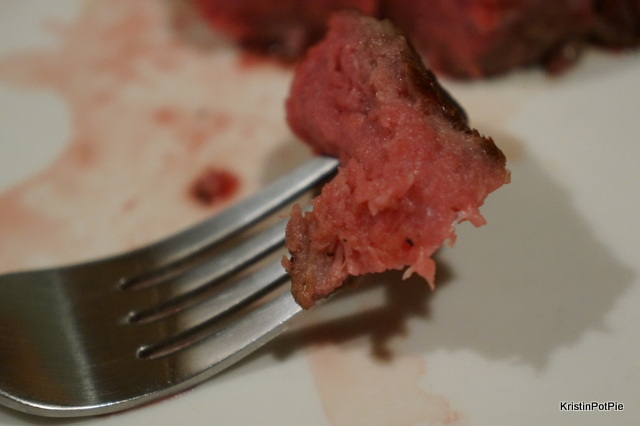 While I didn’t taste “grass” per say, there was definitely a more earthy (“clean”) undertone to these steaks, and as these cattle eat only grass the beefy flavor (what a raw steak smells like and what you would expect the flavor to be) is allowed to shine through. 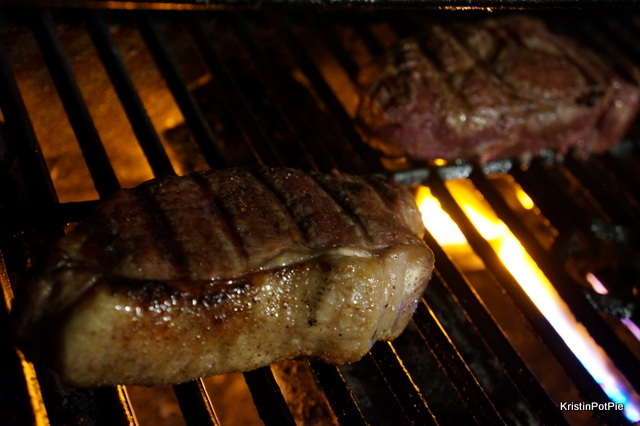 Since more fat gives the meat more flavor, I am sure also that the nice layer of fat around the edge was quite helpful in giving this steak its great complex taste. 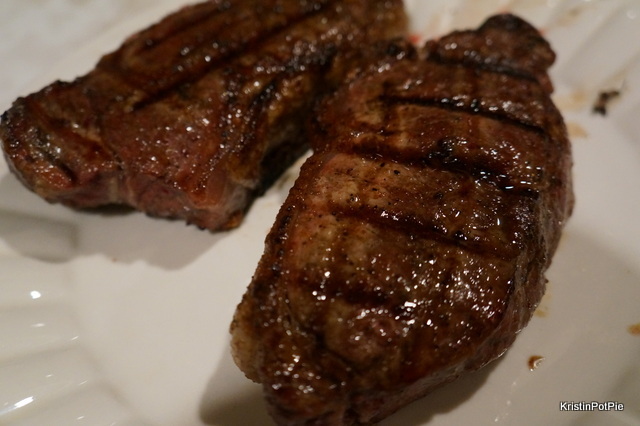 The meat was incredibly juicy and very tender, though somewhat chewy. It was also quite dense – so rich that each of us had only a half a steak and felt full. It is a splurge to buy grass fed, but with the added health benefits (it is lower in saturated fat as well as higher in valuable nutrients like vitamins A & E and omega-3 fatty acids), and the fact that it is more humane and better for the planet, I feel it’s worth it to try and incorporate grass fed as you can. And these steaks would be an excellent choice!